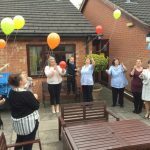 Today we opened Ashfields Care Home to all so that we could remember together the friends we have sadly lost. 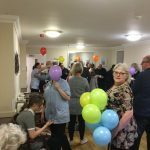 Not only was we remembering residents but also a staff member and friend to many of us, Carer Annette , who sadly passed away after a brave fight against cancer in November last year. 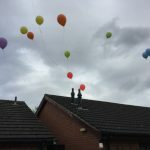 Family and friends were invited to come along to remember and celebrate the lives of their loved ones. We stood together and reminded ourselves about times gone by. Everyone was offered a Photo Memory Card so that they could write their own personal message to the person they were remembering today. 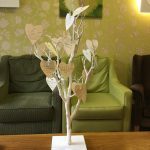 Mr David Howe from the local Babtist Church came along to take a small service and read these cards offering the person who wrote it the opportunity to place it on our Memory Tree personally. Once this was done everyone went outside into the courtyard with a balloon and sent them soaring into the sky together. This was a very touching moment for us all and somehow brought everyone closer together. 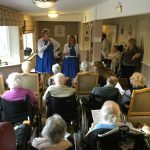 We had tea and cakes and enjoyed entertainment by L & A Vocals who sang all our residents favourite songs to remind them of their pasts and enjoy the present time with us all. 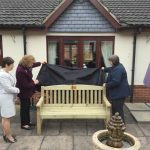 After everyone had said their goodbyes Susan and Margaret, Annette’s sisters kindly and bravely unveiled a bench which they had donated to Ashfields Care Home in memory of Annette. 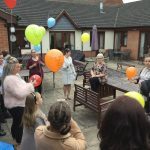 We really do appreciate this and Annette will always be remembered by staff and residents at Ashfields.